I'm writing from a steamy train looking out the window at rice field after rice field in a glowing green. Every inch of Indonesia seems to be cultivated with something or crowded with houses and traffic filled roads. In the last few years as the economy here has grown many people have bought motorbikes and they crowd the roads and weave in between the cars. The roads and infrastructure can't handle it all and its made for some extra long rides for us, especially since its the holiday season and school is off so people are on the go. On the bright side this means that we get to join them at the local sights which can be quite fun since for some reason many people ask to take photos with us like we are some exotic creature. It feels fun to be special! Plus Indonesians have wonderful big smiles and endlessly giggle which is infectious and the inevitable response to a photo session. Buffaloes are revered in Tana Toraja. This boy was proud of his who was waiting to be given as a gift at a funeral. At the suggestion of my wise travel friend Grace, I spent a week in Sulawesi exploring the culture of the Torajan people, a culture that believes strongly in the passing of ones spirit from death to their next life. The great thing for a low budget traveler like me is that in Tana Toraja I could afford hire a guide, jump on the back of his motorbike and go off and learn about the culture. I heard so much over my 5 days there that I am a bit afraid to even attempt to repeat it for fear of inaccuracies but here goes. Torajans are renowned for their elaborate funeral rites, burial sites carved into rocky cliffs, massive peaked-roof traditional houses and colorful woodcarvings. 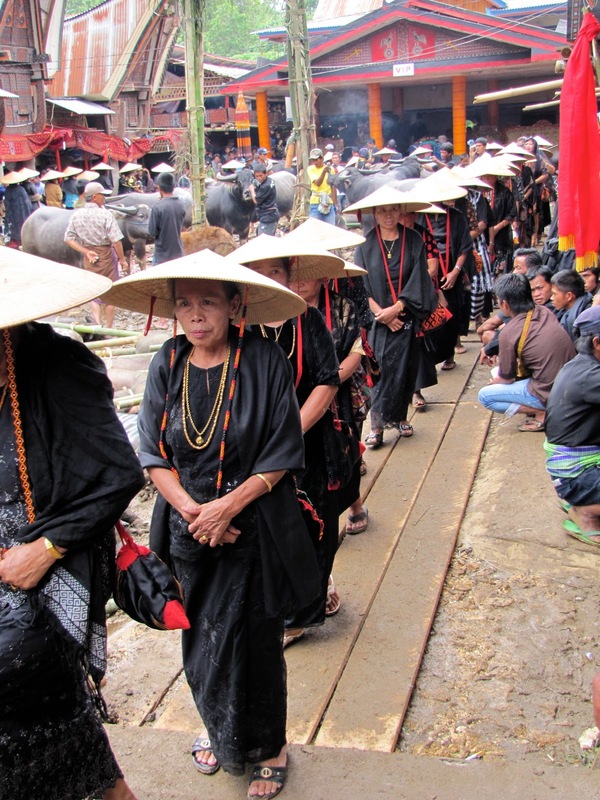 Toraja funeral rites are important social events, usually attended by hundreds of people and lasting for several days. I was able to attend two funerals and see different rituals. Day one is for receiving guests and gifts. This meant an elaborate ceremony where all the guests are honored and led in a procession around the courtyard by the family of the deceased. Although on a daily basis the extent of traditional dress in Tana Toraja is more like jeans and a t-shirt on the first day of the funeral everyone is decked out in their finest Torajan clothes. Each guest or family has brought a gift which often is a live pig or water buffalo. These gifts are displayed in the courtyard and recorded and announced in a ceremony to the crowd. Throughout these two days I kept having to pinch myself to prove I was really there. The enormity of the celebration and the total "Wow, I'm having a National Geographic moment" was incredible. Torajans have realized that tourists are interested in their traditions and welcomed us with open arms and bright smiles. On each day there were a small handful us but comparing that to the 1000 local attendees were certainly did not affect the spirit of the celebration. On the last day of the funeral the casket is placed in the family tomb. Over hundreds of years, Torajans have been carving graves in stone cliffs, caves and building elaborate mausoleums that look like little individual houses bigger than many New York apartments. The deceased is buried with some valuable possessions and ancestors continue to leave offerings at the side of the these tombs. Family members are often entombed together over the years. The idea is that the spirit will live on. Some tombs also have tau tau effigies with them that represent the people who were placed there. Another interesting thing I got to attend when I was in Toraja was the Rantepao Weekly Livestock market which takes place once every six days based on the Torajan calendar. At this market they sell water buffaloes and pigs, the two major gifts for funerals. The hierarchy of these two animals couldn't be more pronounced. 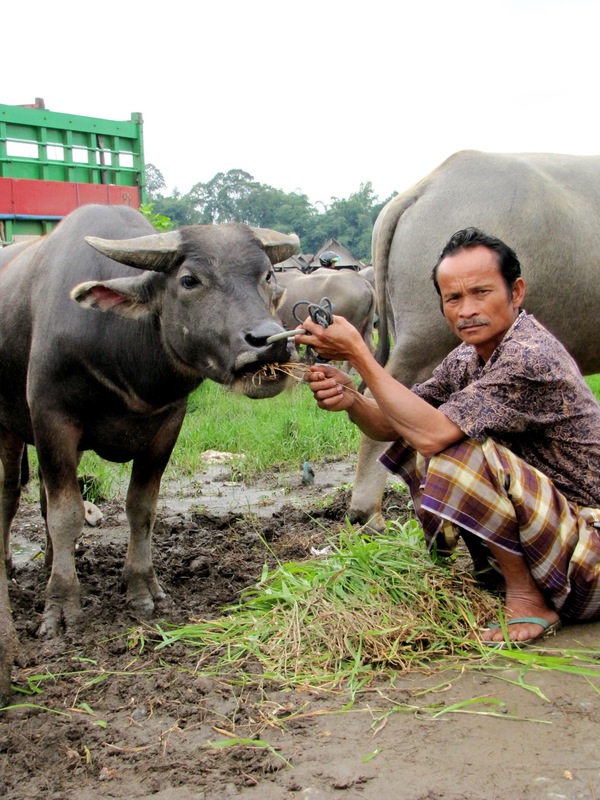 Buffaloes are brought to market and washed and cleaned and cared for to improve their value. Owners pet them and feed them handfuls of grasses that are sold in huge sacks. They sell for 1000s of dollars so they are definitely something to be proud of. Watching the pigs in the market and at the funerals was one of the rare times I wondered why I eat meat, but then when I was offered pork as part of the funeral I swallowed it up. You know the saying. You just have to get back on the horse! For now I'm meant to be a meat eater. 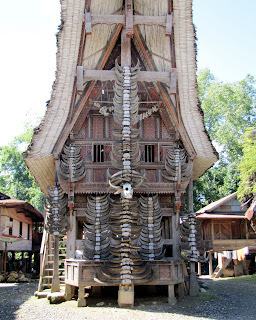 All in all, visiting Tana Toraja was well worth the two days travel it took from Jakarta to get there. I feel like I learned a lot and met a lot of wonderful people and hope I have been able to give you a small piece of the experience. I didn't think coming to Indonesia, the largest Islamic country in the world would mean learning new Christmas traditions. 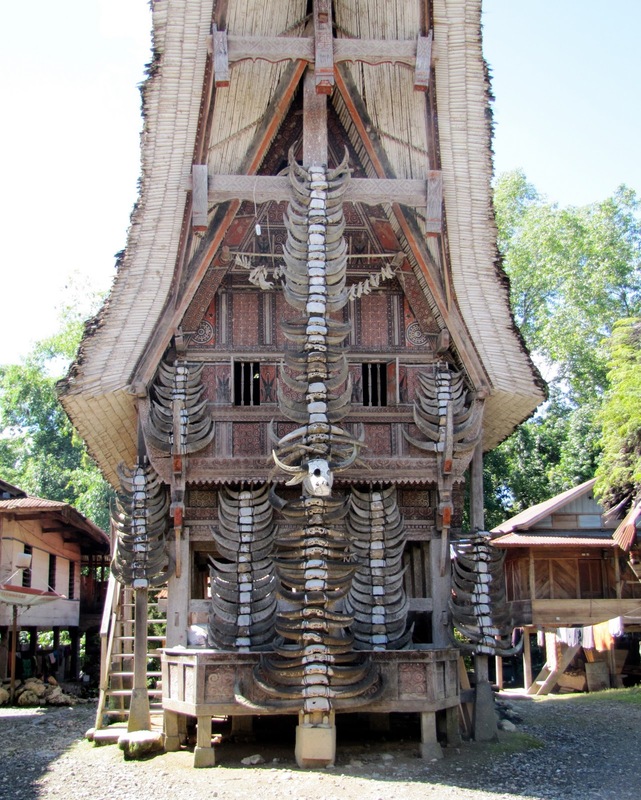 But arriving in Tana Toraja in Central Sulawesi, I could tell my expectations were wrong. The drive up the main road was lined with Christian churches and I arrived into the main town, Rantepao, in the dark greeted by the colors of blinking Christmas lights everywhere which made it clear that this area celebrated Christmas in a big way. This meant Christmas Carols playing in every store and restaurant and Christmas trees decorated with big puff of white stuff to simulate snow, something they definitely never get in this part of the world. It meant the constant crackling of fireworks which apparently are let off every night of December. I decided to partake is this tradition and bought a bunch of different explosives and set them off to the thrill and entertainment of a whole bunch of kids. In Tana Toraja, Sulawesi, Indonesia, the big tourist activity is attending funerals and visiting many different kinds of graves. This one is in a cave from 100s of years ago. Tau Tau effigies are created for some of the buried. Ancestors continue to maintain the graves and leave offerings like clothes, cigarettes and bottles of things besides the graves. Rice paddies cover ever inch of available land in Torajaland. I've seen only seen 28% percent of the world. Better keep traveling. Click here to see my photos from my latest trip to Detroit and see all the cool things there are to do there. National Geographic Traveler wrote a Cover Story about Detroit - I'm such a trendsetter! My dear friend Paula lives in Detroit so I have visited more than half a dozen times in the last 10 years. Paula is a real advocate for Detroit and has showed me every nook and cranny. So you can imagine that it was very exciting to see Detroit on the cover of National Geographic Travel (March/April 2012) and know that I have been to every place he mentions and even eaten at Good Girls Go to Paris Crepes founded by Torya Blanchard, Paula's friend who is featured in the article as a young entrepreneur bringing new life to downtown. Read this article and hear the bright, beaming side of Detroit where history, architecture, cars, public art, music, from Motown to 8 Mile, culture and new possibilities are brimming all over. Lalibela, a World Heritage site, undoubtedly ranks among the greatest religious-h­istorical sites in the Christian world. Ok, so one of the downsides of Ghana was the complete lack of coffee. For those of you that know me these days, you know my afternoon coffee is like a shot of happy juice in my day. While I tend to run pretty well on adrenaline on these trips I still missed coffee. So arriving in Ethiopia was a wonderful next step. Here everyone drinks these little macchiatos. For those of you that don’t know that is an espresso with milk and lots of foam. Plus here there is an added bonus, the milk is thicker and creamier and just better! They are so good that I have been stopping more than once a day. It’s a fun place to sit in the sidewalk cafes amongst all the men. I think they just look at me like another crazy “ferengi” (foreigner) since there are very few other women around. Also there seems to be a middle class growing "Starbucks" cafe culture. Check out the impostor. Writing about the countries I visit in Africa is so much harder than other places I have been. First off, my visits are pretty packed with Princeton in Africa partner site visits, time with current and past Fellows and trying to keep up with emails and Princeton in Africa work from the US versus trips to the various tourist sites. What that tends to mean is that I don’t have a lot of extra time to sit back and think about what I am seeing. Usually when I travel for pleasure, I try to read both fiction and non-fiction books about the country I am traveling in. I try to read the local paper every day and get a sense about the current state of affairs of the country I’m in. Unfortunately on my work trips I don’t always get a chance to do this. Traveling to 3 or 5 countries in 5 weeks each year usually means I hardly know what is really going on and instead just get a chance to dig deep into a particular issue by hearing one of my Fellows daily experiences at work or visiting an organization that Princeton in Africa partners with. I’ve gotten to learn lots about the treatment of HIV, particularly in youth, issues in Africa education in a few countries, issues concerning drought and successful strategies to handle it like building rainwater harvesting systems or developing better local solutions for filtering existing water sources and I’ve certainly gotten to hear a lot about humanitarian aid and food security. One of the things I really love about traveling is getting to meet people from so many different countries. While I do love meeting locals from the places I am traveling too, I actually am talking about all the other expats and tourists I meet along the way. Traveling for Princeton in Africa opens me up to a whole new set of expats who work in Africa. I love sitting in on a meeting with a group of people from all different places and listening to the accents, watching the different cultural responses and often feeling very comforted by the other American in the room if there is one. It’s another reminder of how diverse the world is and another place where I can find my inner American and feel that deep sense of connection and comfort.